As much as I am into fashion, I went into this whole wedding planning business with zero preconceived notions of what I wanted in the outfit I would wear to marry the man of my dreams. Our wedding is modern boho-chic & I was looking for a dress that allowed me to be me, capable of being danced in, & pockets are always a plus. The first time I tried on a wedding dress was with my maid of honor at Olia Zavozina here in Nashville (definitely recommend this shop to any Nashville area brides). This little shop has the most amazing dresses & I had so much fun playing dress up for an afternoon. But I didn't find The One. You guys know I love me some J.Crew, so it was always a wish of mine to try on the dreamy J.Crew Wedding gowns, but the only store is in NYC. After I won a coupon from The Ruffled Blog for a Brooklyn Wedding boutique, The White Gown, I mentioned to my sister how it would be a dream come true to find my wedding dress in New York City, & the #SeesterTripNYC was born. I still am in awe that we were able to both get away for the same weekend & am beyond thankful that she was there with me! The J.Crew wedding store was a little underwhelming (maybe because I had hyped it up in my head for so long). Macy's Demetrios Wedding Salon was gorgeous & I found a top contender there. But I found The One at The White Gown in the DUMBO neighborhood of Brooklyn. Emily at The White Gown totally got my boho-chic vibe (the flower crown I was wearing might have clued her in) & I immediately fell in LOVE with two equally gorgeous, but completely different dresses. I could have seen myself in either gown, but in the end I had to bleed to find The One. As I was slipping on the dress I barely scraped my foot against the exposed brick wall of the dressing room. It was the lightest scratch, hardly hurt at all, & I didn't think anything of it at first. But I soon realized that my pinky toe was GUSHING blood (my swollen feet were under a lot of pressure I guess!) - all over the sample dress, on the floor, on me, on the chair, on everything. I looked like a zombie bride! The shop girls sprang for the first aid kit & my crafty sister quickly had all the red spots out (apparently hydrogen peroxide is a super blood remover!) - PHEW! After the whole ordeal was over, we put the veil on with the dress & I knew it was The One. Fingers crossed that is the worst thing that happens while I am wearing the dress! Congrats on finding your dress! Looks like so much fun! I need to make a trip to DUMBO next time I'm in the city! Hooray! The White Gown is where I found my wedding dress as well. It's such an awesome shop. I was so lucky to find my dream dress there, and since it was a sample, it was DIRT CHEAP. I hope you're as happy wearing your dress for your big day as I was wearing mine! I love these photos. 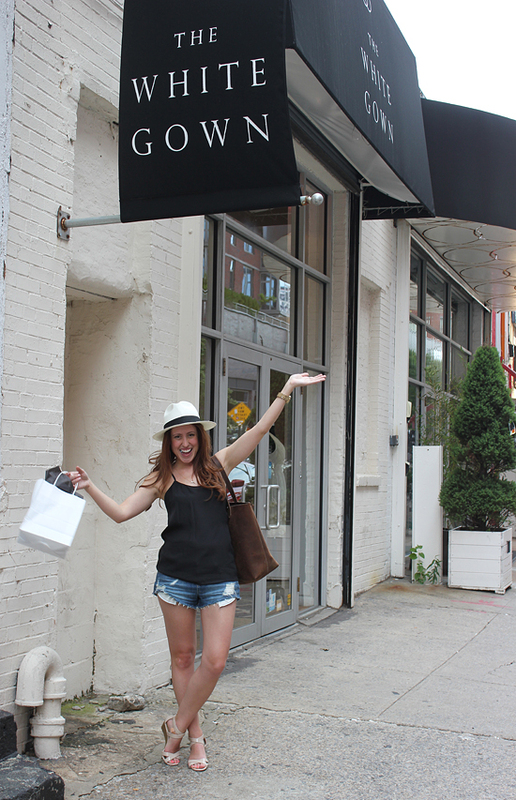 I've never been to New York, so I love seeing all the awesome places you and your sister went! Congrats on finding the "one" and I think it is one of the Anjolique gowns! Lovin' the cliff hanger :) Can't wait to see the dress you have chosen! What a story, it was definitely a sign! So glad you found your dress. Happy for you, what a great story. So awesome that you found a dress you love . Found your blog again! Love this look. And glad to hear shopping went well. Congrats!! haha this is funny! I've only tried on bridesmaid dresses and some women touched/saw my goodies, too. Congrats on finding the dress! love this outfit! very laid back chic! and your smile!!! Congrats on saying yes to the dress! I can't wait to see it!! That's that most exciting (sorry that it had a bad note but it worked out in the end) wedding dress story. One that you'll remember forever. Congratulations on find the perfect dress. I felt the same way about the Jcrew dresses! And can't wait to see what you chose! So exciting!! I can't wait to see the dress that you picked! I'm sure it's gorgeous! Oh c'mon..at least tell us what collection it's in! :-) My dress was a Demetrios gown & I was IN.love from the moment I put it on. I didn't really have a budget going in but it was only $1k which I thought was excellent especially now that I see the prices on Say Yes to the Dress! I'm glad you found your One. Especially on your second trip shopping. (I also went with my maid of honor, but to David's Bridal just to get an idea of shapes, etc that I liked. Then went on a trip with several ladies to San Diego to find the One & it was the second dress I tried on!) Can't wait to see you in it! Congrats on the dress! I'm sure you will be a beautiful bride. Happy to hear you're following tradition. He will be thrilled to see you in your dress on your special day! Congratulations on finding The One Jessica... I can't wait to see what you chose! A sister trip to NY sounds like the perfect way to find the perfect dress, I love it. YAY! SO glad you found your dress! And love your shopping outfit, simple and chic for NYC. Congratz on finding The One. I am glad that you are waiting to releave. It makes life funner but I do have an idea of which one you will be in. DUMBO is great! I'm so glad you found "the One", you look so happy in those photos afterwards :). So glad to hear you found the one... bonus points for finding it in BK! 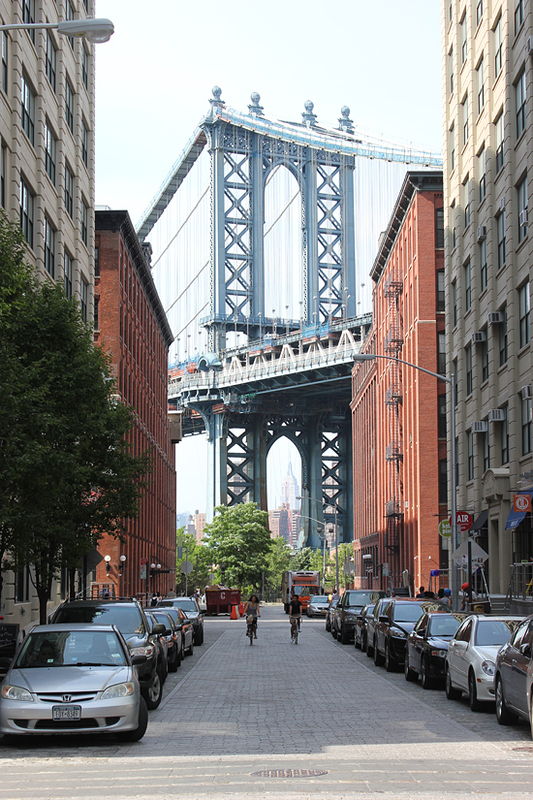 Isn't DUMBO the cutest neighborhood? So amazingly exciting! Congrats on finding the one! That is SO exciting!!! Congratulations on finding THE dress! Can't wait to see how it looks! YAY! Congrats on saying yes to the dress...such an awesome feeling and I bet you looked gorgeous :) And I love love love those shorts...you look so cute! No way! What a small (& stylish) world! Also, super jealous that you scored a sample! You go girl!! I just had to keep telling myself, "this isn't anything they haven't seen before!" Still, kinda had me squirming! Pretty, but not really anything that jumped out to me. And what's a girl got to do to get some champagne!? hehe, NOPE! I am horrible at keeping many secrets, but not this one! The Demetrios gowns were all so stunning, and yes that was around what my budget was too, which is why I didn't even bother going to Kleinfeld's! Oh gawd! girdle shopping is next... don't scare me lady! thanks! I felt so hip in DUMBO, & love that my dress was born in such a cute area of my new favorite city! I guess it did give me time to sit down and feel comfortable in the dress... silver lining? Glad that my sister was there so that I didn't have to buy the blood covered sample dress too! But yes, overall the trip was something that I will remember the rest of my life! That's perfect. I have tickets to a wedding event called "TheNotWedding". The tickets that I have are for Atlanta, GA. If you want them, they are yours. Dang. I don't know anyone else to give them too. I tried to do a giveaway with them but no luck, zero entries. This might just be the perfect way to style cutoffs. 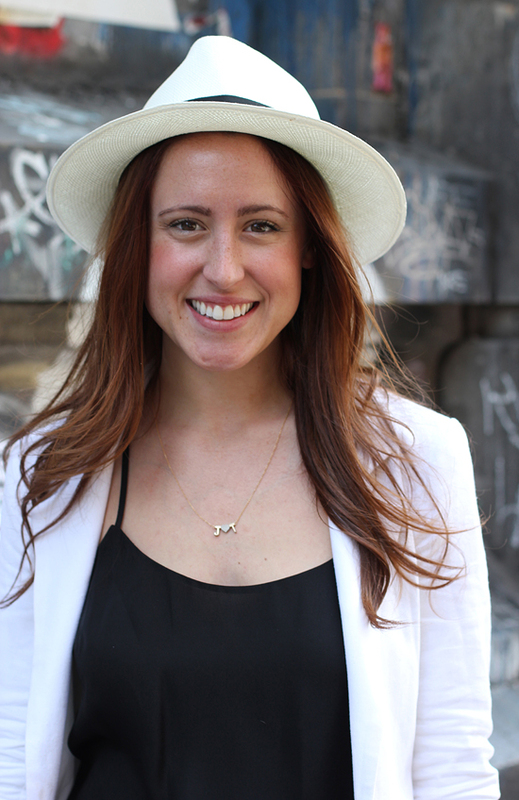 Love that you added the panama hat and blazer! Thanks for taking the Denim Cutoff Challenge!